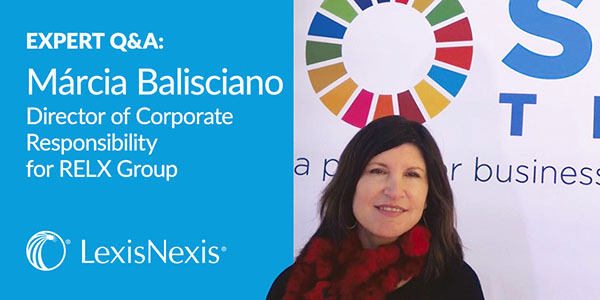 Márcia Balisciano is Director of Corporate Responsibility at RELX, the FTSE30 data and analytics company (and LexisNexis parent company), who was in Davos this year to take part in a panel discussion on how women leaders can help achieve the UN's goals. On a freezing afternoon at the SDG Tent in Davos, she explained how corporate responsibility has moved up the agenda of companies, employees, investors and governments. What has been the trend in corporate responsibility and what are the drivers of that trend? You are speaking here at the 2019 World Economic Forum in Davos. What have you observed this week in relation to sustainability? What are the risks for companies who do not take corporate responsibility and sustainability seriously? Finally, tell us how corporate responsibility has been implemented in the RELX Group?